Pomegranates or anar are considered as the ‘fruits of paradise’ in ancient cultures. It’s not only their unique combination of crunchiness and juiciness but also their nutritional value that makes them so tempting and irresistible. Traditionally, pomegranates are known as a symbol of health, with several Ayurvedic and herbal medicinal scriptures mentioning their use as a natural remedy. 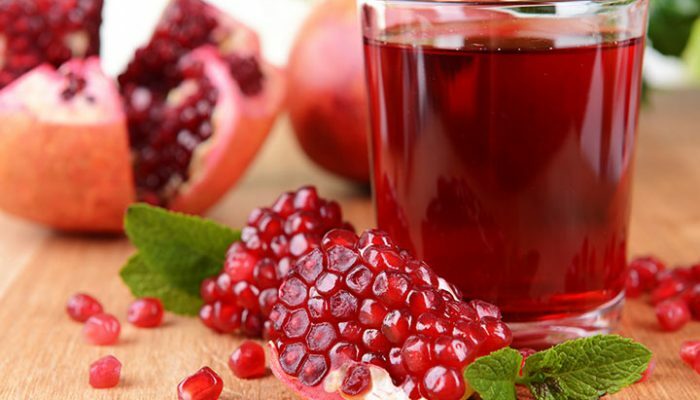 Pomegranate juice can have a great impact on health, particularly on the health of the heart, by keeping the arteries flexible and decreasing the inflammation in the lining of the blood vessels. It is known to reduce atherosclerosis, which is one of the leading causes of heart disease. It lowers the risk of blockage in the arteries which can cause a restriction in the flow of blood to the heart and brain. To keep your digestive system healthy, you need to include fibre-rich sources in your diet. Eating a pomegranate every day is a good way to add fibre to your daily diet. One pomegranate can fulfil about 45% of your daily recommended intake of fibre, which is about 20 to 35g. Pomegranate juice has strong anti-bacterial and anti-microbial properties which help fight viruses and bacteria and boost our immunity system.It significantly reduces microbes that are found in the mouth commonly responsible for cavities and staph infections. Its anti-microbial properties make it an inhibitor of HIV transmission. Out of all the fruits, pomegranate has the highest potential to inhibit the transmission of HIV. Its small molecular structure penetrates deeply into the skin to provide ample moisturisation and hydration to the skin. Thus it soothes dry and irritated skin. Its content of punicic acid, an omega 3 fatty acid keeps the skin constantly hydrated by sealing in the moisture. Apart from reducing the body’s internal oxidative stress, pomegranates also help lower psychological stress that you go through your personal and professional life. According to a study conducted by Queen Margaret University, people who drank pomegranate juice had lower levels of cortisol, a stress hormone that is increased under stressful situations. Ever wondered why we grow old and our skin develops wrinkles and other signs of ageing? Well, it is because of free radical damage that affects your cells. Polyphenolic compounds in pomegranates are powerful antioxidants that can delay the process of aeging. Therefore, eating pomegranate keeps your skin glowing and radiant for a long time. Pomegranate juice is not recommended for people suffering from influenza, cough, and constipation or for those with a phlegmatic condition.People with certain plant allergies and asthma are always at a greater risk of developing an allergic reaction to this fruit. General allergic reactions include, vomiting, red itchy eyes, hives and difficulty in breathing.